How do I earn PD hours for Learners Edge PD courses? In order to earn hours for completing a PD course, you will need to successfully pass the Final Assessment with a score of 80% or higher. 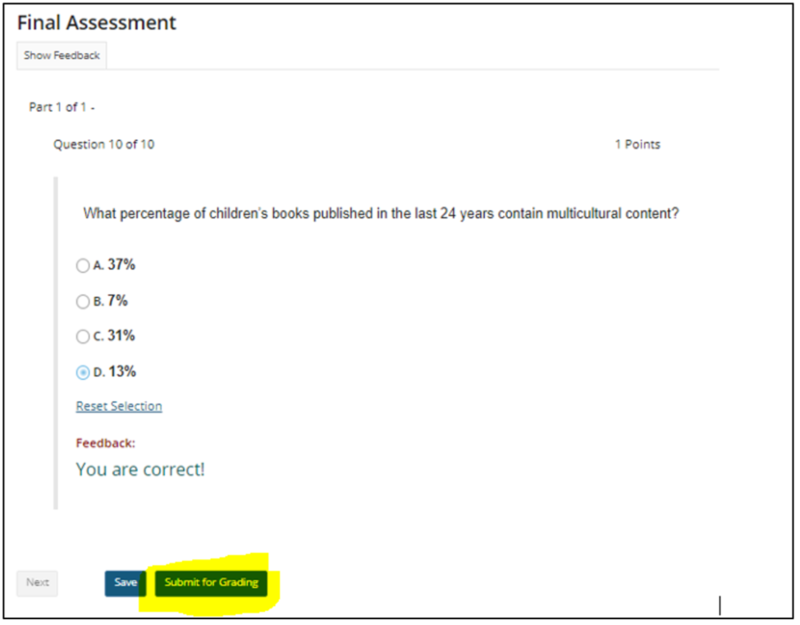 You will access the Final Assessment at the bottom of the course module and then click “Begin Assessment” on the next screen. Each question is on a separate page so once you answer the question, click “next” to continue to the next question. If you need to stop before completing all questions, click “save”. The quiz will begin where you left off. When you complete the last question, click “Submit for Grading”. If you need to know how to check your quiz results, read the article "How do I check my quiz results for the PD course?" If you need to know how to print your letter of completion documenting your PD hours, read the article "How do I access my letter of completion documenting PD hours earned?"